As a blockbuster of familiar features but unique successes, “Interstellar” welcomes comparisons to numerous films but consistently stands apart from them. Nolan has fashioned a singular experience that works with the busy simplicity of his previous movies, like “Inception”: It’s recognizable and easy to follow along, but with a clear interest in the philosophy that puts these tales into action. In the scope of blockbusters, “Interstellar” is like Nolan’s version of Paul Thomas Anderson’s “The Master.” Instead of following up “The Dark Knight Rises” with a project with similar ambition, Nolan proves his guff as an interesting mainstream filmmaker by striving for bigger ideas, without holding the audience’s hand as they move into the unknown. Some viewers may get lost with the strange places that the film takes them, but Nolan’s narrative ambition is an entirely telling force on its own. Even in the movie’s rougher patches, when it deals with on-the-nose drama, the intent is always there. Better yet, such passion in the project is always singing. With regards to space movies in particular, “Interstellar” might welcome comparisons to a previous escapade, 2013’s “Gravity.” A comparison between the two highlights the strength of “Interstellar” overall: Alfonso Cuaron’s claustrophobic event movie is a great roller coaster, one that thinks very smartly inside the box. However, “Interstellar” pioneers outside of it, leaving a mark that may not be as succinct as Cuaron’s film, but is more overall stimulating. The spectacle of “Interstellar” involves the strange places it goes, how it takes you from a farm, to space, and then to the beyond. By the third act, you’re seeing things you have never seen in a movie before, or that you only get shades of when you rematch Stanley Kubrick’s “2001: A Space Odyssey” for the twelfth time. The film is far easier to recommend more than the idea of seeing it on a home theater system. Like “Transformers: Age of Extinction,” “Interstellar” beckons the biggest screen. Your biggest TV will do the job, but there’s no way it could compare to the IMAX screen it was made for, offering towering aesthetics with its length that creates the full experience of a cinematic adventure. At the very least for “Interstellar,” the film warrants your full attention; this isn’t a rental or purchase that can simply play in the background, or get the start-pause-phone-call-dinner-return treatment. If you’re reading this without having seen “Interstellar” already, there’s so much to discover about its experience. Hopefully, no one has ruined its big surprises, or laid out the destinations that the crew heads to, so that you can enjoy this movie as its journey beyond the usual; beyond regular expectations and into the fruitful wonder found in the multiplex movie’s great unknown. In the near future, Earth has become uninhabitable. A farmer (Matthew McConaughey) signs up to lead a small crew of scientists into space, and to different galaxies, in search of a new home planet. Co-starring Anne Hathaway, Michael Caine, Mackenzie Foy, Jessica Chastain, Casey Affleck, and John Lithgow. 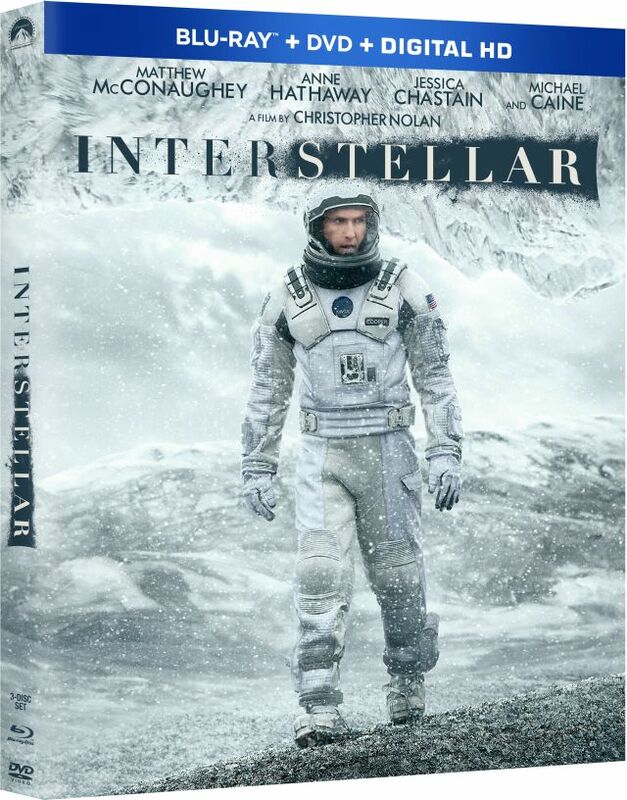 ”Interstellar” was released on Blu-ray and DVD on March 31, 2015.